Ok, Now I'll tell the real thing behind the Chemical, Silver Nitrate, AgNo3. Silver salts have antiseptic properties. It is used as a cauterizing agent, for example to remove granulation tissue around a wound. Brief exposure will not produce any immediate side effects other than the purple, brown or black stains on the skin, but upon constant exposure to high concentrations, side effects will be noticeable, which include burns. Long-term exposure may cause eye damage. Silver nitrate is known to be a skin and eye irritant - says Wikipedia. One fine & gloomy evening, I had a fall in stairs, three at a skip, and perfectly landed or made me sit down with a thud on the fourth. No hits, I thought and I walked less perfectly alright with little limping. Pain started after a few hours and I was in hospital. There the nurse shocked to see a large blood clotted or strained in dark red in my leg. Prescribed with antibiotics, pain killers and pantocid tablets for safe stomach. 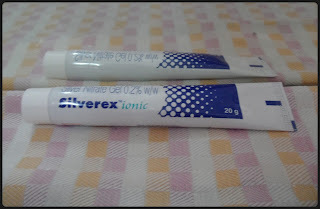 At last the Medicine man wrote down an ointment named, "Silver Nitrate". He asked me to apply on the blood clotted area twice a day. My usual habit is to search for the medicines on internet. But this time, I missed to do so, that costs me to get cure for another two long weeks. Applied over the area, like a gel, for two days with sincerity. Third day I saw the red clad area in my leg had out grown the size that I actually had on the day of fall. It spread its pangs like an octopus. Fear grabbed and now I started my search in net. I found out from forums, that root cause is the ointment, which we have to apply a little over the area, and after a little time, we have to pat out the extras from the wound with a cotton. If we apply a lot or left it as such, it will pass thru' the unaffected areas of the skin and spread thru the epidermis, but not the inner skin. No soaps or creams are useful in this case. It will discolour itself in another two weeks. But as a magic, the blood clotted area, where I applied the silver nitrate, worked pretty and it got clear of the stain. The surrounding tissues are badly red and works in a pretty slow way around. Its better to be my leg, where hiding the stain with clothes. If it had been my face or hands, how would it be. I cant guess of covering me, the whole. This is the ignorance part of our medicine men - doctors, nurses. They must have the knowledge of these things. Some doctors are asking, if we, the patients, are allergic to any medicine. Some wont ask that also. As this Silver Nitrate is concerned, they must listen, when the drug people inform them. Must instruct us, how to use, what are the major side effects of the medicine. So, go through the medicine, while the doctor is writing. And verify whatever doubt that arises with him. Be had them with clean mind and get well. I dint know about the side effect of silver nitrate as I have not experienced it before other than my chemistry lab. Ok now because of you I would be more cautious if any doctor prescribes me silver nitrate for my wounds. It's cool that you write such things.